You know me, I love history, especially art history, so, for the new year I signed up for Let’s Face It 2018 a year long class studying portraiture through art history. 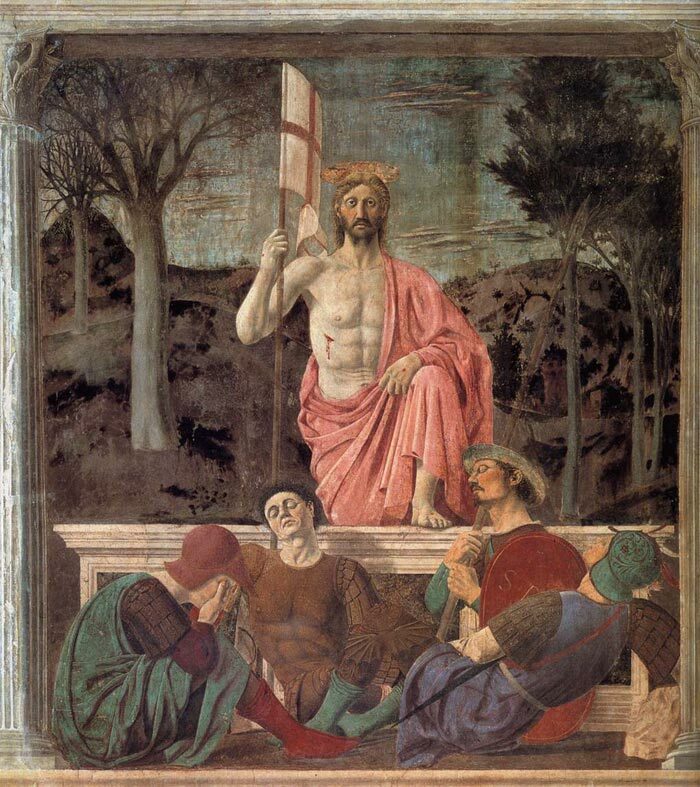 For the first week, the teacher, Kara Bullock picked Piero della Francesca, a renaissance painter who had little influence on his contemporaries, but who, by the 20th century was considered a major contributor, possibly due to writer Aldous Huxley’s assertion that “The Resurrection” a fresco by della Francesca was the best painting in the world. This painting is significant in that the artist was more concerned with the positioning of the subjects in his paining, and how it told a story, then realism- (there are two vanishing points, and the positioning of the guards is a bit strange, one guy in the back doesn’t seem to have legs!!!). As a mathematician and the writer of a treatise on perspective, della Francesca understood realism in the sense that Renaissance painters were concerned (indeed the use of perspective was one of the major discoveries of this time, hence the time periods name) but, he was more concerned with a emotionally provocative image. But his genius really burned bright with the creation of ” Madonna del Parto”, quite possibly the only Christian art exposing the Virgin Mary Pregnant!!! Remember, this was a time when woman with child where defiantly not to be seen nor heard!!! Unbeknownst to me about her significance, I chose to recreate “Madonna del Parto” because I liked her face and the position of her hands but rather than paint her buon fresco, I did so with watercolor. Above is the painting before I added the gold leaf to her headdress. Gold leaf done, but she seems so incomplete. Yes, the assignment is satisfied, but she begs for more. All that is left to do is add the poem. I do love adding significant words on my pieces- especially this poem!!! Every time I read it, I get something more from it. Once again I was Divinely lead to create something magically infused with the Goddesses light.